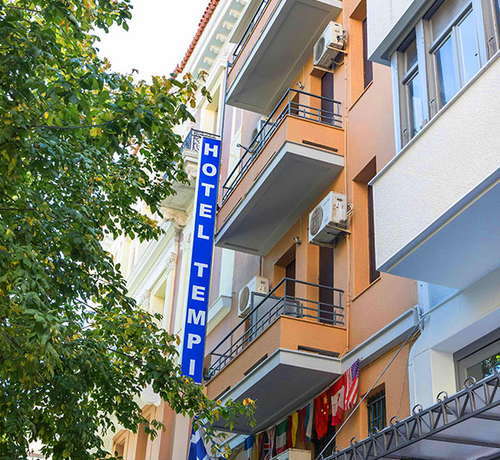 A convenient location, just a short, pleasant stroll from Plaka, the Roman Agora, and right on the happening Ayias Irinis Square and its trendy bars. Double-glazed guest room windows keep out the noise--an especially welcome feature on weekday mornings when the shops on pedestrian-only Aiolou are open and the coffee lovers are enjoying the sunshine in the busy square. 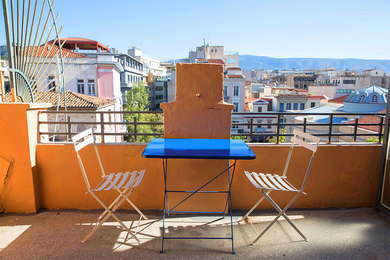 A good value for the center of Athens although expect to share a bath for about half of the rooms available. Single rooms are located on the 5th floor, and you will have to negotiate five flights of stairs every time, as the small lift is used only for carrying luggage. YOU SHOULD KNOW This is a hotel/ hostel category of lodging. room has A/C and satellite TV. The lift for luggage only goes up to the 4th floor. So if you stay on one of the top floors (there are 5 in total) prepare to handle the daily exercise. YOU SHOULD KNOW Several rooms have good views to the Acropolis and to the church of Ayia Irini out in front. YOU SHOULD KNOW The cheapest rooms have shared bathrooms. elevator, but it is used for luggage. A poster recommends having breakfast at a couple of the neighboring cafes, offering a small hostel guest discount. however a shared kitchen where guests can cook up their own meals. No hotel bar; no problem! Many of Athens’ best bars are right on your doorstep. and from the airport (45 min). If you prefer to take a taxi from the airport, it will take about 45-50 minutes depending on downtown traffic and it will cost around 35€ during the day and around 55€ at night (12 a.m. to 5:30 a.m.). There is a taxi rank on Monastiraki Square. souvlaki taverna just off Monastiraki Square. On the square in front, stop for a super tasty souvlaki at Kostas, a little hole in the wall (lunch only). more indie scene? Meander up a couple of alleys to Boiler for some underground vibes (5-minute walk). some rooms even have views of the Acropolis. The free Wi-Fi has a good signal throughout the hotel. that Athenian flock in their droves to the square every weekend. $$$ &middot; 15 Mitropoleos str.